Here is my review of the excellent concert performed by 'Magic' at the Pavilion Theatre in Glasgow on Saturday, February 22nd 2003. 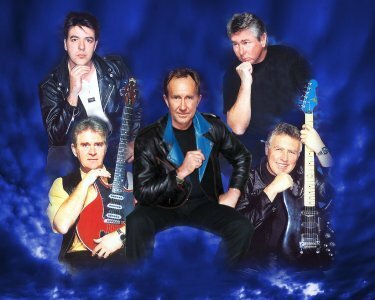 'Magic' are better known in the U.K. as a superb Queen tribute band who regularly play to sell-out venues around the country and Europe, and this year are celebrating their 10th year on tour. It has therefore come as a bit of a surprise that the guys have decided on a 'limited edition' tour performing the hits of the Beach Boys and Electric Light Orchestra during what will no doubt be a hectic year of touring with their Queen tribute show. Having arrived at the venue quite early we had a chance to look around this beautifully Victorian era theatre which has been restored in recent years into an excellent venue for live music. Check out the website at www.paviliontheatre.co.uk for the webcam views of the theatre. The first half of the show was to be the Beach Boys tribute, and the band took to the stage in their 'best' and 'loudest' Hawaiin shirts. The vocal harmonies were excellent as they performed classic hits such as Good Vibrations, Help Me Rhonda, Fun Fun Fun, I Get Around & Wouldn't It Be Nice. The bass player had an excellent high range voice which blended superbly with the bass voice of the second guitarist and the lead singer. The audience certainly lapped it up, in fact I was concerned that the 300+ in the audience were all Beach Boys fans with only a few of us E.L.O. fans, but I need not have worried. The audience was made up of a wide range of ages from very young (our kids were there, aged 6 & 9), right up to 70-ish and all were clapping and singing along. The first half of the concert lasted for about 1 hour but in that time the band performed at least 12 songs, ending with a rousing cover of 'Good Vibrations', and I personally was now looking forward to the 'main event'............. E.L.O music !!!!! After the short break, the band took to the stage in slightly less bright clothing and with an extra member!! 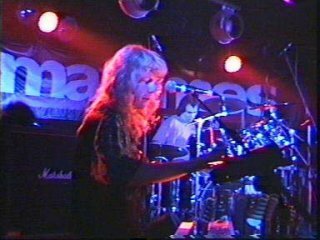 For this part of the show, a keyboard player is essential and Dave Chapman certainly looks the part with his long, curly blonde hair !! The band started off with an excellent rendition of Twilight followed by Shine A Little Love which certainly livened the audience up, as mentioned earlier I was not sure how many were E.L.O. fans but everybody was clapping and singing along by this second track. Next up from Xanadu was All Over The World with the bands' harmonies again coming to the fore. An excellent rendition of The Diary Of Horace Wimp next which I thoroughly enjoyed and this is the first time I have heard the full version of this song played live (The Orchestra and ELO Part 2 only ever performed this as part of a hits medley, and the 'original' ELO as far as I know did not play this song live either). Some more classics followed including Telephone Line with the lead singer perched on a stool at the front of the stage - excellent. Livin' Thing and Sweet Talkin' Woman soon followed with the keyboard player excelling, I'm sure he could add yet another dimension to the bands' usual Queen tribute performance !! The audience really came to life next with Don't Bring Me Down and Hold On Tight. Excellent renditions of Wild West Hero, Rockaria (with the bass player assuming the role of opera queen!!) and Turn To Stone followed before the final song, Mr Blue Sky which was performed to perfection and again all credit to the keyboard player who got the vocoder parts off to a tee - superb !!! After leaving the stage to rapturous applause, the band then returned to perform the classic Roll Over Beethoven which may even have have been better than some of the original ELO performances !!! Well, I must admit I was not too sure what to expect from the band prior to the show, but I can honestly say whether you are a Beach Boys or E.L.O. 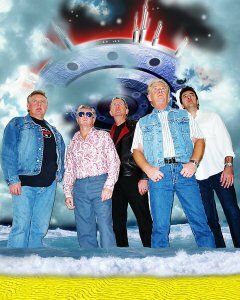 fan, do get to see the band if they are performing near you over the coming weeks, and especially at the price of only £11 and £13, an absolute bargain and a brilliant tribute show !! Finally, if any of the band read this review, please let's have another tour of this excellent show in the near future (preferably near to Carlisle next time though) !!!! Photos & images are (c) and courtesy of www.lmpresents.com .